A friend asked for my recipe for Crunchy Kale and Cabbage Salad recently but emailed me later to say she couldn’t find the walnut oil used for the dressing. She wondered if there was something else she could substitute for the oil. I figured why not go right to the source and use whole walnuts? As it often happens I liked the dressing with whole walnuts better than with the oil. The dressing was creamier and coated the kale and cabbage better. 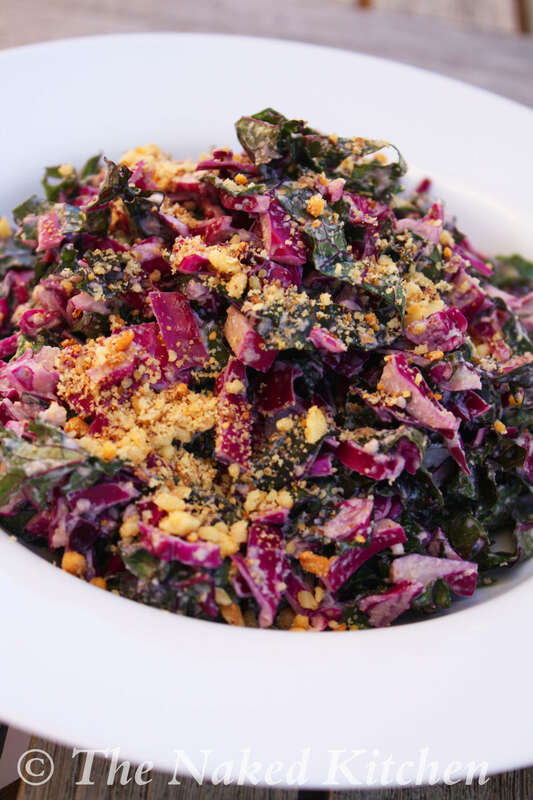 This slaw is simple, uses only a few ingredients and comes together quickly. Try it out and add a delicious crunch to your next meal. 1. Place the kale and cabbage into a large bowl. 2. In a small blender or food processor add the remaining ingredients except the 2 tbsp walnuts. Blend until smooth. 3. Pour over the kale and cabbage. Stir to combine. Roughly chop the remaining walnuts. 4. Sprinkle the chopped walnuts over the top and serve. Store leftover salad in a sealed container in the refrigerator for 1-2 days.